When I’m meeting with clients or prospective clients, I’m often asked how important it is to rank on page 1 of the search engines. It definitely is, and more on that topic in a minute. 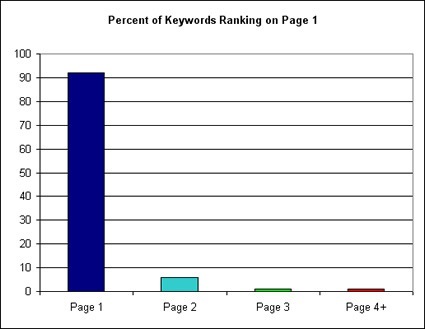 Then it’s typically not long before I’m asked how many keywords clients should rank for. That’s usually a longer conversation where I like to introduce the concept of the long tail (which I’ll be covering as part of this post). 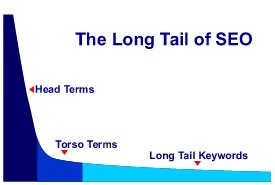 I’ve written about the power of the long tail of SEO on my blog, including details for how to rank for long tail keywords, and my hope is that you’ll soon understand why I feel so strongly about it. In addition to discussing the importance of ranking highly in search and how powerful the long tail is, I often refer to the latest Google heat map study to reinforce my recommendations and to explain search behavior. I find that if you start connecting the dots between high rankings, the latest heat map study, and the long tail of SEO, then organic search strategy becomes much clearer (especially for people outside of the Search industry). So, I ended up running an experiment recently and the results displayed a strong connection between the three elements I mentioned above. In fact, the results were so intriguing that I decided to write this post to detail my experiment! With that quick introduction out of the way, let’s get moving. Like many of you reading this post, I’m fanatical about checking my web analytics reporting. I especially love digging into natural search reports and analyzing which keywords drove quality traffic to site, did those visitors bounce, where did they go on the site, did they convert, which type of keywords did they enter, did they use on-site search, etc. My goal is to see how those visitors contributed to the overall success of the website that I’m analyzing. 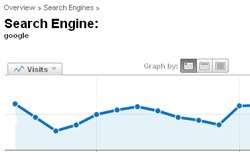 Several of the sites I manage use Google Analytics (GA) to track website activity and I’m definitely a big fan of GA. In early January, a blog post from Andre Scholten caught my attention. 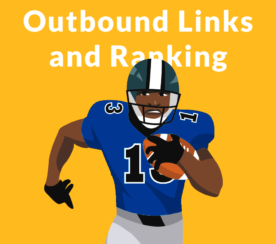 His post explained how to track where your keywords actually rank in Google within your Google Analytics reporting (on the fly). For example, seeing each keyword that led to your site, but also quickly seeing which page of Google it was listed on when people clicked through. Keep in mind, I could use a number of tools to run a position analysis on target keywords, but that’s not feasible for long tail keywords, since you might be dealing with thousands of keywords at a time. 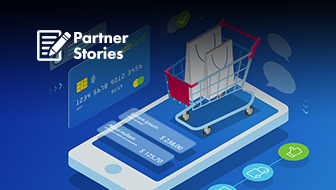 In addition, you wouldn’t have ready access to deeper analytics reporting like you would in GA. So, I read Andre’s post and I quickly set up new profiles and custom filters for a number of websites that I manage. Needless to say, I was eager to see the results in Google Analytics. It was only a few hours before I started seeing the results show up, and I picked up a trend pretty darn quickly. To be honest, it was a trend that I thought I would see, since I know the power of the long tail. That said, when you view it across a large number of keywords, and all at one time, it was definitely intriguing. Then as more and more keywords showed up, the trend simply got stronger. That could have been their second, third, or fourth refinement. The long tail was absolutely in effect and was easily revealed. 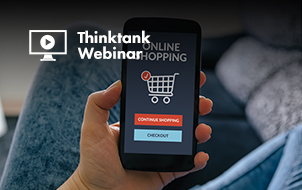 It clearly showed the importance and power of targeting long tail keywords and what that can mean for the volume of quality traffic. 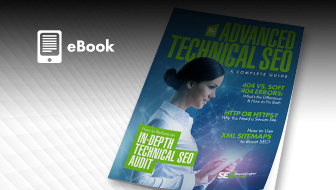 Sure, there were several head terms that ranked on page 1 of Google and those keywords did send a good amount of quality traffic to the sites I tested. But, there were terms that easily could have been the result of someone refining their query after not being happy with the search results. — Sure, that could have been the person’s first query, but it also could have been their third or fourth, right? I don’t think many people in SEO often have a new client walk in and say they want to rank for a long tail keyword of that length!  Which leads me to my next point, the long tail of SEO. Don’t worry, this will all connect by the end of my post. To quickly review, the long tail of SEO includes longer queries, typically including three or more keywords. 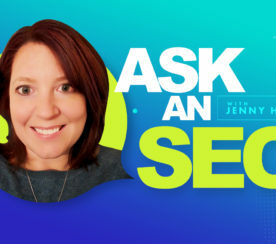 These longer queries derive from your target keywords (or your head terms). For example, a head term might be Nintendo Wii, but a long tail keyword might be what are the best Nintendo Wii games. 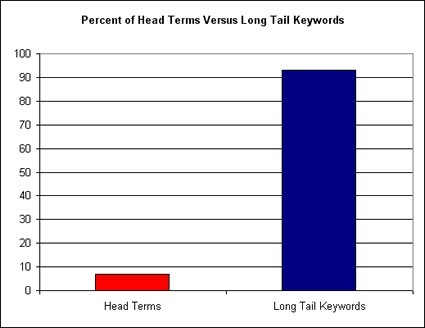 Although many people focus on head terms, the long tail might generate more quality visitors in aggregate (taking into account all long tail keywords versus just head terms). Anyone tracking SEO for a living has probably seen the impact of the long tail. OK, so we’re getting closer to the connection I mentioned earlier in this post. Stick with me! There’s one more element I need to explain before we get there. I’m sure many of you have seen or heard about Google heat map studies. 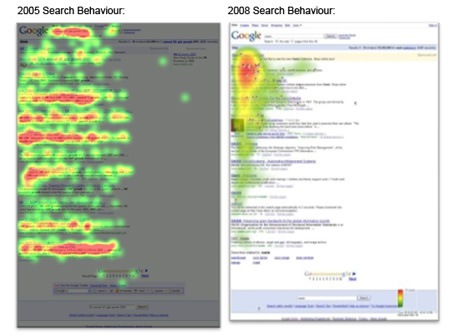 One recent study from Think Eyetracking (September 2008) revealed that people are now scanning the first few results on page 1 of the SERPs, and if they don’t find what they need, they are refining their searches. Think about someone searching for nike sneakers, then nike running sneakers, then men’s nike running sneakers, and finally men’s nike trail running sneakers. That person would have refined their initial search three times before clicking a result. The results from this study also match what Google recently released when studying Universal Search. 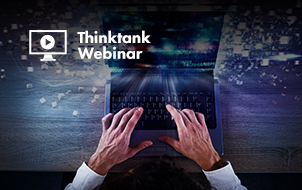 So the important question is, do you have content that can rank for long tail keywords? For many websites and businesses, the answer is NO. That’s unfortunate, since long tail keywords are much more granular and specific (and can yield highly targeted visitors). As mentioned earlier, I set up new profiles and custom filters so I could track the position in Google for keywords leading to several sites that I manage. The sites I chose to test have varying search strength and focus on different verticals. 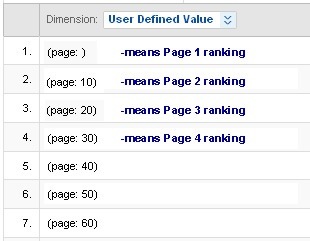 The custom filter showed me which page each keyword was listed on when visitors clicked through by displaying the number of the first result on that page. 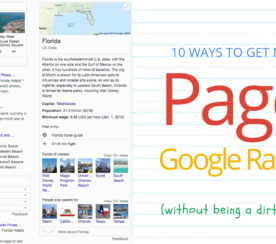 For example, (Page: ), (Page: 10), (Page: 20), (Page: 30), where (Page: ) means page 1 in Google, (Page: 10) means page 2, (Page: 20) means page 3, etc. See the screenshot below for how it looks in Google Analytics (with my notes in dark blue). Quick Disclaimer Before Revealing the Results: Although this was not a scientific experiment, the results across various websites I tested were overwhelming. Based on seeing the results, I also started checking other sites I manage that weren’t initially part of the experiment, and saw the same trends across a large number of keywords. I will provide the results from my experiment below, along with how each type of keyword performed (head or long tail). 92% of the keywords that led to the websites I used in this experiment ranked on page 1 of Google. 7% of the total keywords were head terms and 93% were long tail keywords. Traffic-wise, long tail keywords comprised 78% of visitors from organic search and head terms drove 22% of visitors. Ranking on page 1 of Google is extremely important, with 92% of the keywords driving traffic to the sites I tested, ranking on page 1. 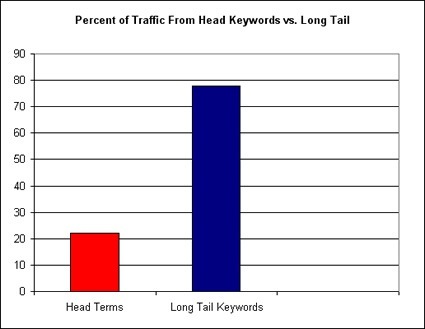 The percent of traffic from long tail keywords far outweighs the number of visitors from head terms. Setting up this handy filter in Google Analytics enabled me to easily see the impact of high rankings along with the power of the long tail. By the way, you should also set up this filter so you can easily analyze the rankings of all your keywords on the fly… You can still use various search tools to run a position analysis on your head terms, but this filter enables you to see rankings across all of the keywords leading to your website. So What Does This Mean For You As A Search Marketer? Yes, it definitely took a while, but I told you I would tie this together at some point! For those of you that have benefited from the power of the long tail (or have been knocked over by it), please chime in! I’d love to hear your thoughts.